Britons spend half as much time on the landline – but use ten times more mobile data – than just six years ago, as new research from comms regulator Ofcom reveals changing attitudes to the traditional telephone number. 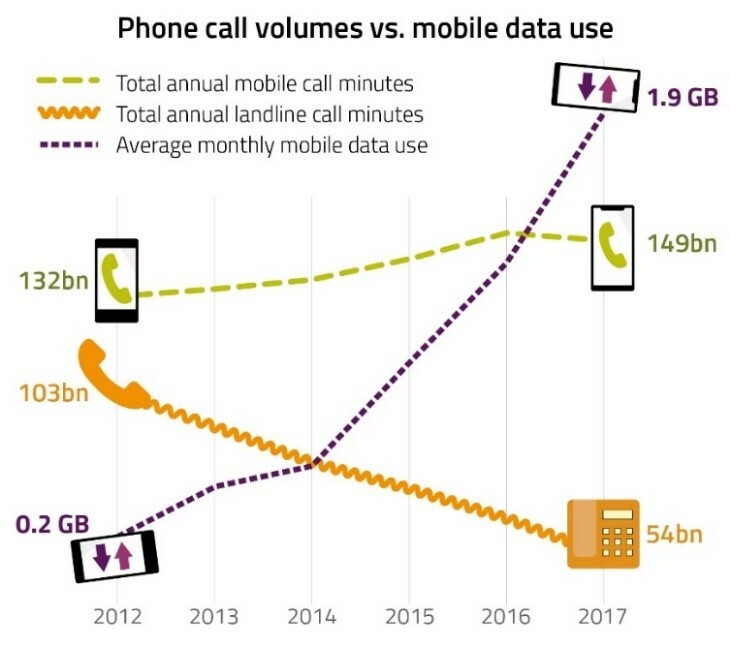 In recent years, the amount of time Britons spend talking on the landline has nearly halved, while the amount of mobile data used has increased almost tenfold. When they do ring friends and family, people now rely on contact numbers stored in their phones. A 22-year-old from Belfast admitted: “I don’t need to remember numbers”. It’s now common to click on a name or web link on your mobile to call a number, rather than manually dial it. There are 1.3 billion landline phone numbers in the UK, of which 400 million are currently allocated to telecoms operators. Ofcom allocates phone numbers, and keeps an eye on how they’re used. When area codes were first created in the 1950s, they had particular significance on a telephone dial. Numbers corresponded to two-letter identifiers, such as AB (22) for Aberdeen. So today, Aberdeen’s area code is ‘01224’ (01AB4). There are 610 area codes in the UK. As a result of increased demand for numbers, the numbering system has changed several times over the years. However modern phone keypads still offer clues to how certain area codes first came about.